We are nominated for the “Special Prize” at the world final of the FICTS Festival in Italy. 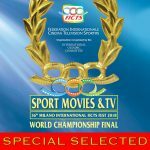 Our TV documentary “VIERZEHNEINHALB – Basketball on Wheels” has been nominated for a special award at the Sport Movie & TV Festival in Milano, Italy. Prices and awards will be given in the middle of November and we will be there to represent the project and the sport pretty well. And maybe we can bring home a nice award. The premieres of FOURTEEN-AND-A-HALF COLLISIONS. We are completely stunned! Two awesome and emotional days are over. Such beautiful premieres! On Sunday we celebrated the world premiere of FOURTEEN-AND-A-HALF COLLISIONS at the Filmfestival Hamburg at the Metropolis movie theater. All the protagonists, the crew and many friends, families and companions were with us. Director Guido Weihermüller introduced the audience with a touching speech. All of you, and especially those who couldn’t be there, may find some great pictures of the world premiere on Facebook or in the slideshow right here. Next day it got a little more laid-back but not less emotional and beautiful. At the sold out inclusive premiere of FOURTEEN-AND-A-HALF COLLISIONS at the accessable Schmidtchen on the Reeperbahn even more wheelchair users and AB’s could watch our movie and talk afterwards to the film makers, the protagonists and to each other. Small Fires played some great live music as well to complete a great night. Who wants to join the good memories of Monday should check out the slideshow we edited for you. The inclusive premiere was the kick-off for the initiative “VIERZEHNEINHALB FOR HAMBURG” hosted by the Evangelische Stiftung Alsterdorf. 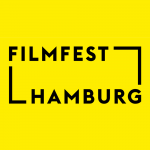 In this context and spirit FOURTEEN-AND-A-HALF COLLISIONS will be screened at accessable places in Hamburg first. In order to spread out to whole Germany and the world later. 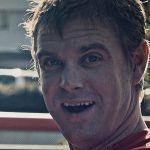 You may get the latest news and dates here at the web documentary. The band members Lars Dahlke and Ruben Seevers also contributed further compositions to the scenic film music. One day after the world premiere at the Hamburg Film Festival, there is another opportunity to see our movie. With the support of the Evangelische Stiftung Alsterdorf we show “Fourteen-and-a-half Collisions” at the Schmidtchen-Theater on the Reeperbahn and here we can offer much more wheelchair seats than in a movie theatre. Monday, October 1st, 2018, 8:00 p.m. The event is part of the “Initiative VIERZEHNEINHALB for Hamburg” and is supported by the Evangelischen Stiftung Alsterdorf. We would also like to thank the Schmidtchen-Theater and the bar “Alte Liebe”. 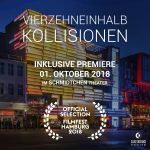 Filmfest Hamburg 2018 shows “Vierzehneinhalb Kollisionen”! “Fourteen-and-a-half Collisions” premieres at Filmfest Hamburg! “FOURTEEN-AND-A-HALF COLLISIONS” GOES CINEMA. BE ON THE RED CARPET! We toss up 3×2 tickets for the cinema premiere in Hamburg. After the webseries and the TV documentary “FOURTEEN-AND-A-HALF COLLISIONS” comes to the German theaters. Just answer the question below and you get the chance to join us exclusively on the red carpet of FILMFEST HAMBURG on Sept. 30th 2018 or at the wheelchair accessable screening on Oct. 1st 2018 at “Schmidtchen” Theatre on Hamburgs famous Reeperbahn. 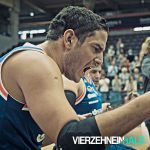 What is the highest total of classification points allowed on the court per team at one time in the German Rollstuhlbasketball-Bundesliga? Inbox the right answer with subject ‘Prize Game’ to redaktion@vierzehneinhalb.de and we meet the lucky winners at the movie premiere. Closing date is the 24th of September, 2018. The winners will be selected according to the random principle and contacted by us from the 25th of September, 2018. The prize only implies two tickets to the “Fourteen-and-a-half Collisions” movie premiere in Hamburg. Journey, stay and so on are on everyones own. Just one participation per person is allowed. Any recourse to courts of law is excluded. The collected data will be used only for the prize game. You have the right of information, correction and deletion of your data any time. 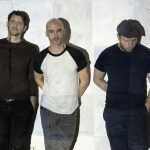 Save your part of the limited edition of the tv documentary! Some of you already expected it, some rumors got around. 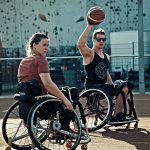 We can make it official today: the TV documentary “Vierzehneinhalb – Basketball On Wheels” is out now on DVD. You can enjoy the journey of Anne Patzwald, Mareike Miller and Kai Möller with the national team and to the world championships in Hamburg. The documentary is subtitled in English completely! You can get the limited edition first at the World Championships in Hamburg. You may find us daily from 16th to the 26th of August from 3 to 6 pm at the DGUV booth at the expo tent in front of arena 1. Come by, we wait for you! 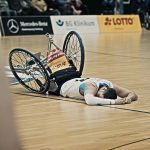 It won’t be long before wheelchair basketball goes TV! Save the date: 10th of August, 2018 at 4.15pm in the ARD-Sportschau. 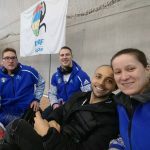 In the 43 minutes long documentary we join the the German national players Anne Patzwald, Mareike Miller and Kai Möller on their way to the world cup at home. That’s all for now. But stay tuned and check Facebook and Instagram for updates and the latest news. 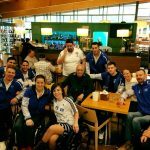 From 16th to 26th of August the Wheelchairbasketball World Championships take place in Hamburg. Overall 16 male and twelve female national team will fight for the title as the best team of the world. Kai Möller and the men’s national team have to face the teams of Marocco, Canada and Iran in pool A. Mareike Miller, Anne Patzwald and Maya Lindholm play against the USA, France, Argentina, China and Algeria in pool B. On top Marcin Balcerowski is in the game with the Polish national team as a Baskets player. But anyways, everybody will be in: whether live in the gym, at home watching the stream or just by heart and mind. We are really looking forward to this great event in summer! In the end it was 7th place. After three defeats in the group stage against the OWLS from the UK (66:77), Kardemir Karabükspor Kulübü (69:78) and Besiktas RMK Marine Istanbul (55:61) from Turkey there wasn’t anything more possible. Last match for place 7 against London Titans coach Holger Glinickis team decided with 70:54. It wasn’t the weekend, as the Baskets might have expected it or at least hoped for. Anyway the Baskets played as a team and had a good time in Bilbao. Now the sportive part of the Baskets season is over. We are excited to see, who is going to stay in Hamburg and plays on next season. We are not sure about, what to like more: Going to Bilbao in Spain finally for the season highlight? Or the fact that coach Holger Glinicki and play maker Ali Ahmadi signed their contracts for the next season. We love both of it! In Bilbao some tough fights with great opponents wait for the Baskets during the group stage on the way to the semi at the Euro League 1. That’s the goal of coach Holger. We hope for even more and feed you with fotos and stories! The latest results you may find right here. Until the season of the final in Bilbao the Baskets enjoy the first summer vibes. Trees are still a little bald. But sky is blue, air is warm and the sun is shining – finally summer in Hamburg! Besides practice the Baskets use their time off a lot. Gokart, relocation, climbing forest, skate park and so on, and on, and on. You won’t get bored with this people! We joined them on their adventures and could shoot great footage with our protagonists, which you will see soon. By the way, the Baskets couldn’t quit balling also after practice. Tough matches on the street court. No worries: all shades (and bones) stayed in one piece. These three girls from Hamburg play the #WorldcupAtHome. 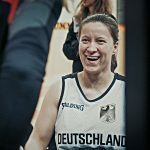 Mareike Miller, Anne Patzwald und Maya Lindholm – these three ladies of the BG Baskets put themselfs on national head coach Martin Ottos shortlist troughout the selection camp in Bad Honnef in the last days and now go to the World Cup in Hamburg. VIERZEHNEINHALB was with them all the time on site until the nomination. And we could say: you girls really derserve it! Congrats to the three of you and all the other ladies who are nominated so far. Wow, that was an emotional roller coaster ride! 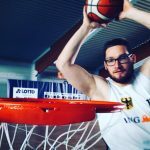 But after three hard days of selection camp we’ve got good news: 27-year-old Kai of the BG Baskets Hamburg was nominated to join the national team squad for the Wheelchair Basketball World Championships 2018 in Hamburg. Congrats Kai, we love it! An from tomorrow on it’s the women’s turn. 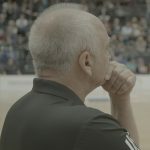 National head coach Martin Otto calls his players together in Bad Honnef and makes his decision, if Mareike and Anne will also be part of the World Championships in Hamburg this summer. VIERZEHNEINHALB is with them and we are more than excited! Asael laid on the ground of the court many times. The crowds darling put everything in one last time. In the end he squirmed with pain because of a cracked rib. He and the other Baskets fighted as a team against Lahn-Dill in the deciding game for the play offs- and lost. Final score: 59:81 (33:33). The play offs are missed now, the frustration of captain Kai and his team was noticeably. Congrats to the best for teams of the division from Wiesbaden, Trier, Elxleben and Wetzlar. So season is over now? No! It’s not yet over! The Baskets focussing on new goals and make new plans. In the end of April Euroleague is taking place in Bilbao. The final of the season should be celebrated with sportive success as a team. But it’s still a long way to go until then and we have some great other stories ahead. Good news first: Baskets can make it to the playoffs on their own on Sunday. On top of that it’s a home game. Great Chance! Bad news: only a win brings Asael, Ali and the others to the playoffs for sure. And it’s Lahn-Dill to play against. Little wonders are always possible. Munich suprisingly could win against Lahn-Dill at home earlier this season. On sundays match the Baskets with king of tactics Holger have to stand together as a team one more time and fight to make the dream of the playoffs come true. …and super exciting! In two weeks the regular season is already history. By that point the deciscion was made, if the Baskets would have extended their championship period. It’s a tight race against Wiesbaden, Munich and Zwickau on the last sead in the play offs semi. Kai and his team have to win both their matches in Hanover and the final home game against Lahn-Dill. Enormous pressure and an exciting situation for the team. Besides individual class of the team, passion and cohesion are promising keys for the season final. We are more than curious, if the new built team will make this challange a winner. Jalla Baskets! 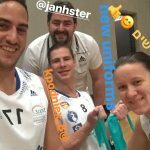 Anne, Karlis and Kai chill with their old friend and team mate. It was a nice meeting with Gaz Choudhry – last year playing for the Baskets and this year in the jersey of Amiab Albacete. The match against each other the Baskets got the short end of the stick. But the final result wasn’t bothered anyway. 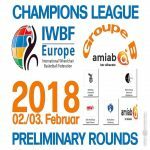 After two victories against Le Cannet from France and the Italians from Giulianova the Baskets finished third in pool B of the Champions League preliminaries. Karlis was even voted as MVP to the all star team of the tournament. His comeback was only one month ago. Great achievement! With those results the Baskets continue to play international and travel to Spain in the end of April again. Animo Cestas! Champions League is coming next. That’s why the Baskets going all the way to Spain. They are called ‘BG Cestas Hamburgo” over there. ‘Cesta’ is the spanish word for basket. For the preliminaries in group B will take place in the nice city of Albacete. 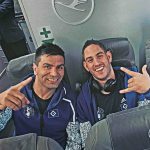 Start is already on Thursday when the players fly from Hamburg to Valencia and to take the bus from there and going to Albacete in two hours. Even on Friday the Baskets meet an old friend. Gaz Choudhry played for Hamburg until the last season before he was traded to the tournaments host BSR AMIAB Albacete. Before that the Baskets play against Amicacci Giulianova from Italy. On Saturday Beşiktaş Gymnastic Kulübü from Turkey and Le Cannet from France are waiting. Depending how they are doing the Baskets qualify for the next round or other European tournaments. On Sunday the team flies back from Madrid. We cross our fingers for great results, save travels and some sun! During the last weeks we shooted a lot with Mareike. She lives in Hamburg-Eimsbüttel, she is AB, and she is captain of the national team. During the last weeks we had some shooting days wie Mareike on our schedule. We visited the 27-year-old in her appartment and joined her for a meeting of the national team. We could shoot some great footage, which you may see in the next time. Already before Christmas Mareike visited the University Macromedia in Hamburg. 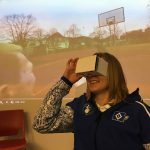 The sportsjournalism students presented some new formats for VIERZEHNEINHALB to her, which they’ve created during their 5th semester. In that process very exciting ideas came off such as an virtual-reality-experiment. Mareike went straight for trying it in front of the students to get an idea of it. Time flies! First half of the season is done. Favorites are made. And, to be honest, it’s not the Baskets. 10:8 points mean a positive record and fitfth place after nine games in the championships for Hamburg. Captain Kai and his team got enough space climbing up and down the over all conference. On Sunday the Baskets lost their last game of the first round against German champion RSV Lahn-Dill straight (93:59). But it was the first game in this championships period every single member of coach Holger Glinickis squad could score. The team play will also be of great importance in the last two matches before the mid-season break. With four points out of two games the Baskets could celebrate Christmas with a playoff position. We are excited for the journey. The congrats for the inofficial autumn championship go out to Erfurt and the RSB Thuringia Bulls. Without a single loss the team around star player Matt Scott and former Basket Jake Williams could finish the first half of the season. At least since then the Bulls are the undisputed favorit for all national cups and championships. We also keep fingers crossed fot the internationals. Amsterdam Calling: Baskets got a weekend off. 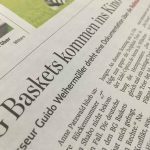 After the 83:52 win (42:22) over Hannover United last Thursday evening, some of the Baskets were in a hurry. Coach Glinicki gave his players the weekend off. A welcome opportunity for some time to do something else together besides the court. Ali, Asael and Even headed to Amsterdam. They went to the dutch capital by train. It was the first time in the megacity for all of them: “It was a great time, we had much fun”, Asael said, after coming back on Monday. Captain Kai kept it calm and visited his parents in his nordish home. Anne visited the island of Sylt with her mother. Others enjoyed the silence and stayed in Bergedorf. But that’s enough time off! The Baskets are all back and preparing in Hamburg for the hard away game on Sunday against champion and cup winner Lahn-Dill. Keep calm and free throw! Baskets to dominate FT% stats. 83:66 (32:30) win over the Baskets 96 from Rahden, great teamwork and second place overall in the league – tremendous! Not quite innocent: the free throw (FT%) stats. 72.73% of their FT’s went directly into the basket on the sixth matchday of the RBBL. 16 points have. Top scorer Kai (22 points) made six out of six from the foul line. Ali and Marcin also had 100.0-FT% (2/2). Marcin is also far up in the national ranking. 88.90 FT% makes the man from Poland 4th overall. Captain Kai is close with 84.20%. Vasily (76.90%) is the third Basket in the top ten FT ranking. Asael had the most trys by the way. He could made only 12 out of 29 points. But keep your head up! At this time of the season stats are only numbers and not significant at all. So: keep calm and free throw! 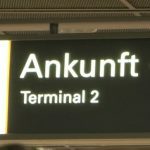 Filmförderung Hamburg Schleswig-Holstein funds VIERZEHNEINHALB. We are delighted! The production funding from northern Germany funds our TV movie. Latest information about the screening and the broadcast date you may find on VIERZEHNEINHALB first. The regional broadcaster ‘NDR’ also came with its film crew to the edel-optics.de arena and shooted the Baskets game as well as the VIERZEHNEINHALB team working that day. 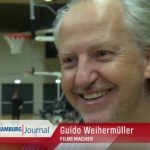 The team had to accept a defeat over Wiesbaden (67:77), but therefor our director Guido smiled into the camera and talked about the project and gave some insights. You could rewatch the TV-report, which was screened in the show ‘Hamburg Journal’ on 23rd of October, at NDR’s VOD service online. Baskets to wear new jerseys on sundays home game. 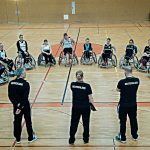 Before the Rhine River Rhinos will be hosted in the home arena at the Inselpark in Hamburg-Wilhelmsburg, the players have another must go on their schedule. Mandatory photo shoot for the latest squad photo. Actually the Baskets would have loved to pose in front of the Elbphilharmonie. Due to the weather conditions they changed location and now shoot in the arena. Never mind! Everybody is full of joy because of the new jersey anyway. Asael captures the moment on Instagram together with Karlis, Anne and staff member Jan. Tomorrow the “models” will become athletes again and can show against Wiesbaden how they shoot in the clean clothes. 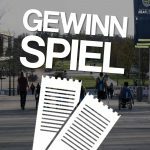 Arena visitors can watch some exclusive VIERZEHNEINHALB footage besides a great game. 3 pm in Wilhelmsburg. We will be there! Holger calls sundays 70:57 defeat (44:25) “unfortunate”. But it could be a welcome wake-up call early in the season, the coach goes on. What is way more unfortunate: playmaker Ali’s injury after a crash on the court. Eventually he could play on, but had tosee a doctor afterwards. A x-ray screening this week should bring light into the dark. 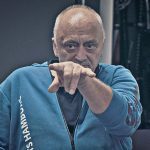 With his experience and 17 PPG Ali is a fundamental player for the Hamburg team. The good news of the day: Evan Thorne (Photo) had his debut in a competitive for the Baskets in Zwickau. First minutes – well done! 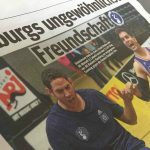 The “Hamburger Morgenpost” about a special friendship. Asael & Ali – a great article about two great people. 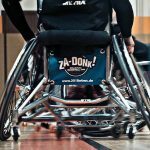 And just one of the moving stories of the BG Baskets Hamburg we are going to tell in our filmproject “VIERZEHNEINHALB – A Basketball Team on Wheels” in the near future. But for now: time to buy a newspaper! Or you could read it online right here. One player of the Baskets scored very successfull in the home opener. Vasily Kochetkov is the Baskets MVP of the match. 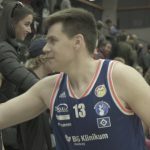 With his 26 points the Russian wield enormous influence on the 71:69 (35:41) win over the Doneck Dolphins Trier of his team. After two victories in two matches Hamburg takes second place in the first German division. Whoever needs reliable predictions on the match results should contact David Schulze. The team coordinator of the HSV forecasted an intense thriller for sundays match with a tight result in the end. And that was totally correct: the home-arena was full of excitment and emotins in the very last moments of the match, when Hamburg where up only two points. With a lucky ending for the BG Baskets. The regional newspaper “Hamburger Abendblatt” wrote a nice article about us. Moment of shock in Munich while season’s kick-off match. Right in the match Asael Shabo holds a tire of his wheelchair in his hands. Quick pit stop by team manager David Schulze and the actions goes on. 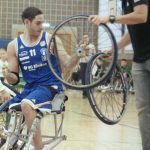 Even this little obstacle can not stop the BG Baskets by winning their first game of the season against the promoted team RBB München Iguanas. Head coach Holger Glinicki and his team accomplished their first milestone. Best player of BG Baskets: Iranian playmaker Alireza Ahmadi, who prepared good chances for his crew members and also scored 24 points. New signing (and last one) didn’t come alone to Hamburg. On early thursday morning Alireza Ahmadi touched down at HAM airport. And he wasn’t alone. The Iran brang his wife. Together they will correlate a flat at the site of the medical center in Bergedorf. Alireza is the last transfer in the Baskets team. So Holger could coach and prep the complete squad from now on for the 2017/18 season. But time is running: season kick-off in two weeks. No easy going at the performance test on friday at the BG Klinikum in Bergedorf. Except some smaller injuries there was nothing to complain about from the doctors side of view. Everybody healthy! So no excuses for the practice right after. By the way: the ladies could skip the test. Mareike and Anne already had valid varifications. “I came to play basketball!” This may not a big surpise, of course. He would not have been traded, if the Baskets would like him to do anything else. But the way he insisted his words on this late monday evening let no space for worries. 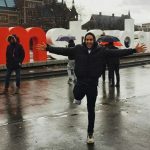 This young guy from Israel with a moving story has goals to reach for sure. But first he should put his emphasis in reaching the skills to compete in the high-leveled RBBL. He definitely got the will.